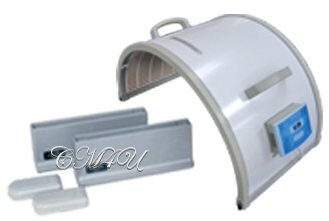 HTE SOQI machines, lowest sale price available. Advanced Japanese medical technology. Natural healing and wellness as nature intended. Superior products, easy to use, made to last, safe and effective. Money back guarantee, 14 day free trial. Shipped from HTE HEAD OFFICE, Los Angeles, CA. 1-3 days West coast states. Heating Pad - x2 sizes. Passive aerobic exercise promotes temporary pain relief, circulation, metabolism, lymphatic system detoxification, stimulation of the autonomic nervous system for relaxation, promotion of metabolic waste elimination, mental focus, sounder sleep, and much more. 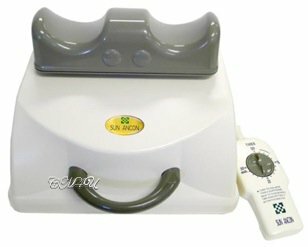 The Sun Ancon is the original Chi Machine as showcased on The Doctors - a daily medical TV show produced by Dr. Phil. Specific oscillation lying flat supports back health (used by chiropractors across the USA). grey polyester and cotton blend. A 'must have' if you plan to travel. The Chi Machine is a perfect solution for days you can't go out, or for those with limited mobility. Ideal for the entire family including children, seniors and athletes. The universal life force within all of us. 110v-60Hz, 28w - 220v by request. Strong, solid, durable, known to last 15-20yrs. x2 Armrests, plus Free E.Books, Video. Far Infrared heat promotes and supports detoxification (heavy metals included), the reduction of pain, swelling and inflammation, healthy breathing, natural skin care, circulation, accelerated healing. Relax as you heal. suitable for all the family, including pets. (5 cents of electricity per hour). Extension stands: 6 1/2" each. - will raise height to 18"
Nothing can survive or thrive without it. 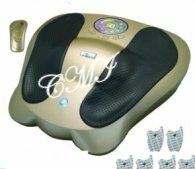 The E-Power machine increases the electric negative potential in the body (negative ions), activates cellular ATP promoting hours of energy, relieves pain, promotes anti-aging properties and much more. Ladies can perform a mini face-lift using the silver pen. Power up your entire body! Machine x2 ports - comes with x1 belt. Electrotherapy promotes connection and communication of the electrical circuitry of the body amongst other things. 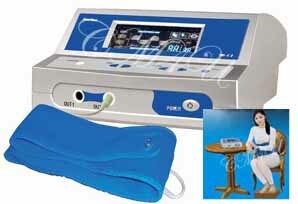 Used extensively worldwide, this unit is cutting edge Japanese healing technology for home or business. Time Settings: 0, 30, 60, 90 mins. Fits up to 45 inch waist. Powerful stimulation and massage via the soles of the feet (all the acupressure points), based on the ancient healing art of reflexology. The Electro Reflex Energizer (ERE), relieves pain, fatigue and soreness in the feet and legs, or hands and arms. Adjust dial to level of comfort when feeling becomes apparent, or as any numbness subsides. Foot-pads are heated. Comes with remote control and x6 electro-pads (the same principal as TENS units), which may be placed anywhere on the body except the heart or head. Of Interest: Multiple users have independently reported elimination of worms and parasites. Size: 15.5" x 12.6" x 4.3"
Self Timer: 5-30 mins max. Begin with 5 min. 1-3 sessions per day. Heating element in each foot pad. Six electro-pads (TENS Units) included. Electrotherapy primarily targets the electrical frequency and circuitry of the body to promote re-connection and communication. Specific frequencies create specific results pertaining to individual health challenges - also known as Electro Medicine or Bio-Resonance, as used in 85 countries globally. shipped from HTE head office Los Angeles. Add State Sales Tax if U.S. Resident. unless a tax free state. Request quote for Alaska, Hawaii, Puerto Rico. Food sources today are contaminated with toxins, such as Monsanto chemicals, dyes, corn syrup, vaccines, hormones and fillers. 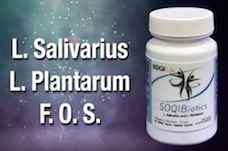 The supplements below should be seriously considered to correct and restore harmony. All four dietary supplements have unique individual benefits, are powerful, they work, and unlike many other supplements on the market, they are actually absorbed by the body. All dietary supplements are organic, vegan, gluten free, non-GMO - no additives, no artificial colors, no preservatives, no chemicals. Non-GMO, gluten free, no dairy, no additives or preservatives, no artificial colors. - x30 scoops per container. Green Drink: Outstanding organic cellular nutrition - creates pH balance, energy and mental focus. Ideal for those who don't eat enough veggies. Not just another 'green drink' product! Pure and active ingredients. No chemicals, metals or pesticides. x60 capsules per bottle - take x1 capsule per day. Organic natural Ingredients are Aloe Vera and Beta-1, 3-D Glucan. Drugs, chemically saturated foods, excessive sugar, and cold weather, all compromise your immune system. 'Party Season' which is Thanksgiving thru New Year (excessive eating and drinking), is the time to check your immune system and strengthen your body for the winter months. Also ideal for people who are vulnerable to illness all year long. FYI Winter: Consider including natural, non-toxic therapies during winter season, such as Vitamin D (15-20 mins of daily sunshine), liquid Vitamin C, cayenne pepper, garlic, onions, and colloidal silver. Vaccinations do not guarantee prevention or safety. Anyone receiving a vaccine should avoid others because they shed the virus thus contaminating people around them (www.pnas.org/content/115/5/1081). Non-GMO, gluten free, nut free, egg free, 100% Vegan. x90 capsules per bottle - take x1 capsule per meal. Advanced Enzyme Supplement - highest quality on the market, containing x12 different enzymes - optimized stomach tolerance. Enzymes are critical health catalysts found in every living organism, in fact the body does not work properly without enzymes. The overwhelming majority of people lack enzymes due to cooked acidic diets! Non-GMO, gluten free, nut free, 100% Vegan. x60 capsules per bottle - take x2 capsules with water, 30 mins before or after meal. Poor Digestion - Use this to re-establish the intestinal flora required for an optimally functioning digestive system. Probiotics protect your digestive system from unhealthy bacteria, viruses and parasites. Revolutionary Health Technology, HTE USA. Available S-M-L-XL (sizes run on small side). Belt promotes posture and lower back support using far infrared heat with flexible, sturdy construction. Also used as a waist cincher. $150.00 (reg. price $200.00 regular size). $250.00 (reg.price $300.00 grande size). Soft, flexible heating pad with adjustable temperature control dial - carry bag included. Soothing far infrared heat therapy for temporary pain relief for the back or shoulders, arms or legs, sprains, soreness, or monthly female pains. NOT to be used as a heating blanket for sleep. Pure Luxury and Style - For your home or business. 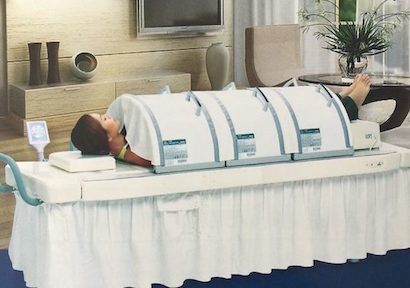 DImensions: L86" x W37" xH40"
Luxury massage table with built in speakers and MP3 player, face cradle, touch control panel, pillow, curtains and x3 Far Infrared Dome Sauna, plus x1 Chi Machine. Motion energy, thermal energy and your own customized music therapy. Would you like to become a distributor in the USA? - No product purchase necessary. Are you interested in selling the Chi Machine and earning income as you help people. Becoming a distributor is $30.00 - you receive a distributor number and sales kit which then enables you to sell the Origial Chi Machine, the SOQI Far Infrared Dome Sauna, the E-Power the Eletro Reflex Energizer, or any other product to anyone you desire directly and immediately. Head office takes care of all billing and shipping. A health and business manual, filled with health and product information, is available for download or on CD. a) There is no need to stock anything as products are shipped directly to client from head office warehouse in Los Angeles. b) Head office will process all credit card transactions. c) Head office will take care of all returns, and repairs if needed. d) There are absolutely no monthly sales or volume requirements. Work at your own pace. 1) Million of Americans are looking for natural solutions to health problems. Becoming an HTE distributor is an opportunity for yourself, your family and friends, as well as health care professionals, both conventional and alternative, to make a difference and help people. 2) The demand for alternative health and wellness products is growing everywhere. a) Baby boomers want alternative health therapies that work. b) Millennials are health conscious and desire natural options and experiences. c) People in general from all generations are rejecting expensive, toxic, conventional medical drugs. These machines and products gift the options needed to avoid or step away from addiction and dependence. 3) The U.S. economy is not clear, the future is challenging, but health care is always needed. This is an opportunity to create or add an income to help yourself, as well as to help others and give back. These machines are suitable for most ages and all professions, from housewife to office, retail to construction, athletes, teens and seniors. on Cancer, and Feng Shui.